Last Tuesday we went on holiday, and travelled to Clarens in the Eastern Free State. Some of the things we saw (and drank) can be seen on our other blog here. My second cousin Peter Badcock-Walters retired to Clarens some years ago, but on Tuesday he had to be in New York, but we called in anyway and chatted to his wife Toni. 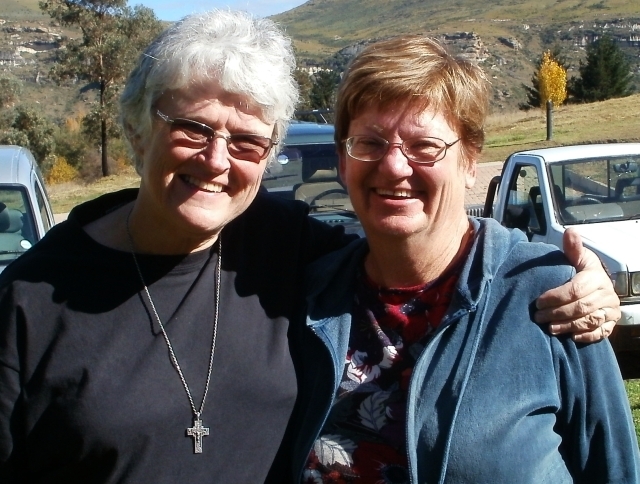 On Wednesday we drove to Graaff Reinet and stayed at the Villa Reinet Guest House, run by more cousins on the Hannan side of the family, Nick and Ailsa Grobler. But unfortunately (for us anyway) Ailsa had gone to visit their son Gavin, who is a chef in Durbai. But Nick told us quite a bit about the family history as well. And if you’re looking for a place to stay in Graaff Reinet, we can recommend Villa Reinet. In addition to chatting about family history with Nick, we visited the Valley of Desolation and Nieu Bethesda, a village about 40 kilometres north of Graaff Reinet, which must be the only place in slouth Africa where real ale is brewed, and very good it is too. We have just learnt of the death of Ron Hickman, Val’s fourth cousin once removed, at the age of 78. Ron was a fairly distant relation, but what brought us together was an interest in family history, and when Ron came to South Africa to do some family history research he came to see us at the beginning, and then, after visiting various archives and family members, he came to see us again for a kind of debriefing session, and shared his notes and findings with us. 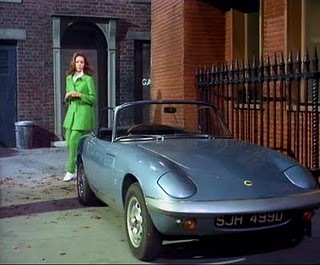 When he visited he was a big hit with our youngest child, Jethro, then aged 7 going on 8, and crazy about cars, and Ron Hickman was a car designer, having designed the Lotus Elan sports car. The prolific designer and inventor Ron Hickman, who has died aged 78 after a long illness, made his fortune from an idea for a simple but multifunctional bench with a gap down the middle to grip wood. The Workmate enabled DIY enthusiasts to saw through pieces of timber without using the edges of chairs and tables for support. The idea had come to him in 1961 when he accidentally sawed through the leg of an expensive Swedish chair while making a wardrobe. Nearly 70m Workmates have been sold since Black & Decker put Hickman’s design into mass production in 1973. After spending three years as a styling modeller with Ford, Hickman moved to the Lotus company, run by Colin Chapman, and quickly became its design director. He headed the team that designed the trendsetting Elan sports car, with its fibreglass body and retractable headlights. This was followed by the Lotus Cortina, Lotus Europa and Elan Plus 2, a design of which he was especially proud. Colin Chapman originally wanted the Elan to have a glassfibre monocoque as well, but Ron knew this could not work in an open top car. Ron therefore rapidly designed the backbone chassis for the Elan and this became the standard Lotus chassis design until Elise with its aluminium monocoque was launched in 1996. The common ancestors were Johan Friedrich Wilhelm Flamme (1780-1832) and Johanna Sophia Breedschuh (1782-1836). J.F.W. Flamme was born at Twiste in Hesse-Nassau, Germany, and came to the Cape Colony as a soldier in the Waldeck Regiment. He was captured during the British occupation and confined in Fort Amsterdam. He may have worked as an assistant to John Martin Durr, butcher, who gave surety for him in 1806. In 1817 he applied for citizenship. Johanna Sophia Breedschoe was the daughter of another German soldier, Johan Christoph Franciscus Breitschuh, and Francina van de Kaap, a slave of Pieter Hacker. Johanna Sophia and her sister Dorothea Francina were thus born into slavery, and manumitted by their father in 1787. JFW Flamme and Johanna Sophia Breedschoe were married on 1 January 1809 in Cape Town, and had 11 children (that we know of). One of them was Petronella Dorothea Francina Flamme (1822-1893), Val’s great great great grandmother, who married Henry Crighton. Another was Johanna Louisa Christina Flamme (1814-1880), Ron’s great great grandmother, who married Samuel Beningfield. The Beningfields moved to Durban and had eight children, one of whom, Johanna Dorothea Beningfield (1838-1900), Ron’s great grandmother, married Edward Hoste Hickman (1834-1901). 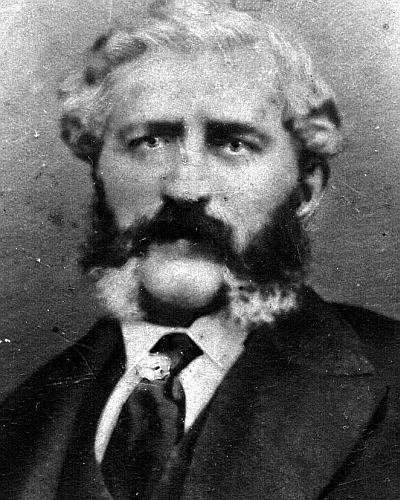 One of the Beningfield sons, Reuben Widdows Beningfield, married his cousin Martha Crighton of Cape Town, and so that branch of the Beningfields is more closely related to us than the others. This was the bare bones of the genealogy we were able to give Ron Hickman, and when he visited the Cape Archives he photocopied enormous quantities of documents to fill out the family story, with lots of biographical information on Sam Beningfield and some of the others. Of the Flamme family, only the daughters married and had children, and most of the sons died young (one while a student at Heidelberg University in Germany) so there are no descendants with the surname Flamme. But some of the daughters were prolific, and, in addition to the Beningfields, Crightons and Hickmans, their descendants include members of the Mechau and Burnard families, who in turn married into the Enslin, Haupt, le Roux and de Villiers and von Backstrom families, and many more, far too many to list here. 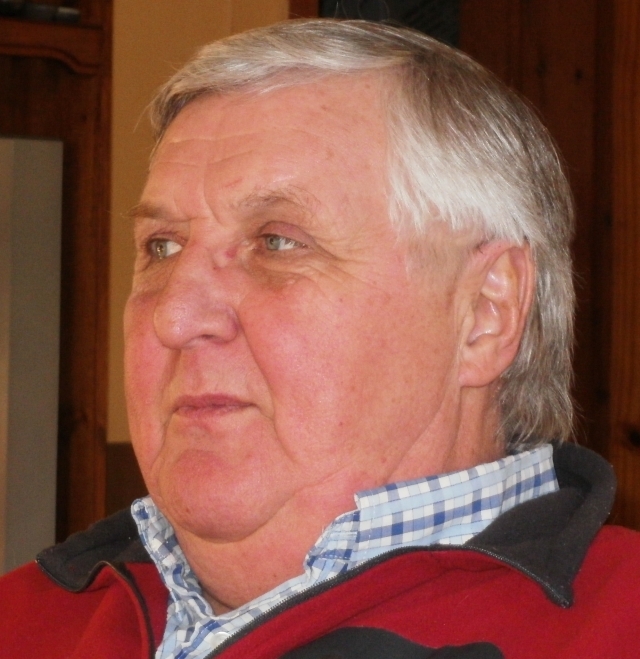 We’ve met some of them, and corresponded with some, but Ron Hickman was the one who was most interested in the family history, and he also met many others on his visits home to South Africa, and we first came to know of many of the later generations of the Beningfield and Hickman families through him. Fifty years ago was my last day as a teenager. It doesn’t seem to have been marked by anything special. Tomorrow I’ll be a genuine old fart. One of the long-standing mysteries of our family history is how my great great grandfather Richard Vause, who lived in Hull, met his bride Matilda Park, who was born in Belfast and lived in Bath. He was living in Hull in the 1851 census, and at the beginning of 1852 they were married in Bath and very soon sailed to Natal. Now we’ve found a couple of census records that could explain how they met. Matilda Park was the daughter of William Park (of Belfast, Bath and Quebec) and Mary Martin (daughter of John Martin of Belfast). 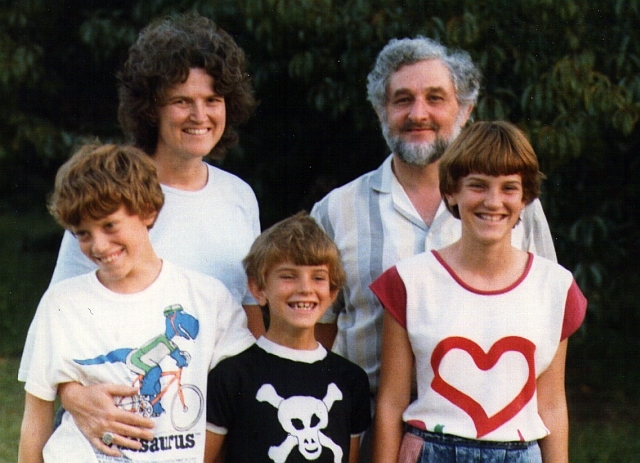 There is more information about the family here and here. One of Matilda Park’s sisters was Margaret Martin Park, who married James Drake, a surgeon dentist, at St Saviour’s Church, Bath, on 8 June 1848, and the 1851 census shows them in Hull, as visitors in the home of Simeon Mosely, also a surgeon dentist, at 15 Whitefriars Gate, Holy Trinity, Hull. Their daughter Mary Edith Drake was born in Hull in about December 1850. Perhaps James Drake and Simeon Mosely were partners in a dental practice, and perhaps Richard Vause was one of their patients, and maybe Matilda Park went to Hull to visit her sister. A lot of maybes, perhaps, or perhapses, maybe. But the fact that members of the Park family were living in Hull in 1850 could explain how Richard Vause met them. In the 1861 census the Drake family were living at Castle Church, Staffordshire, and in 1871 in Warwickshire, where Margaret Drake appears to have died in 1878. Mary Edith Drake was later known as Edith, and was single, living on her own means in Penge, London, in the 1891 census. She appears to have been the only child, and does not seem to have married, so there’s no point in looking for present-day relatives from that branch of the family. Perhaps one thing that could be added is that last week I was contacted by Peter Henderson, who is researching a William Park/Mary Martin family for a friend. That family is in Scotland, and it is not the same family as the one I have been describing here. Peter said a Catherine Raw had a family tree that has conflated the two families. Richard and Matilda Vause’s eldest daughter Polly did marry a John James Raw, so there is a link between the Vause and Raw families, though I’m not sure where Catherine fits in. But the Park/Martin family of Scotland appears to be entirely separate, with no link to ours. Have you ever watched Heir Hunters on the History Channel? We have had heir hunters looking for the heirs of Ignat Bladezki. Two different lots of heir hunters in the UK have contacted us in the last couple of weeks, looking for the heirs of Ignat Bladezki, who died in Coventry, England, in May last year. Our connection is that a daughter of Ignat Bladezki, Franca, married Val’s dad’s cousin, Errol Royden Norman Greene. We met Franca Greene once, about 18 years ago, when she was living in Bryanston with her daughter Courtney, who was then about 14. Errol Greene died in 1980, when Courtney was less than a year old. We chatted about family history, and Franca gave us some details for the family tree. She said her father, Ignat Bladezki, was born in Russia, but had deserted from the Red Army and gone to live in England, so it may not even have been his real name, and he spoke very little about family connections. He married Yola Conti, who died some years before he did, and, according to the heir hunters, he himself died in a nursing home and no one on the staff knew who his relatives were. We’ve lost touch with Franca, and Courtney, who must be about 30 now, may have married and changed her name. But we’d like to get in touch with Franca again, to let her know that her father has died, and also that she probably stands to inherit a sum large enough to make the heir hunters think it worth their while to try to trace the next-of-kin (they make their money by taking a commission). Franca was Errol Greene’s second wife. He had two daughters by his first wife, Dionne and Tracey. They don’t stand to inherit anything, but if they can be traced they may help us to find Franca. Franca told us that Tracey had married a Grant Stack. So if anyone reading this knows where Franca or Courtney are, please ask them to get in touch with us. Errol Greene ran an air-conditioning business in the Eastern Cape, South Africa, before his death in 1980. Twenty years ago this month we went to Namibia on holiday, and one of the reasons we wanted to go was to learn more about Fred Green, Val’s great great grandfather, who was a trader and elephant hunter there for about 25 years, from about 1850 until his death in 1876. We’ve been scanning some old photos, including photos of that holiday trip, and so it seemed a good time to share them and some of the related family history, old and new. 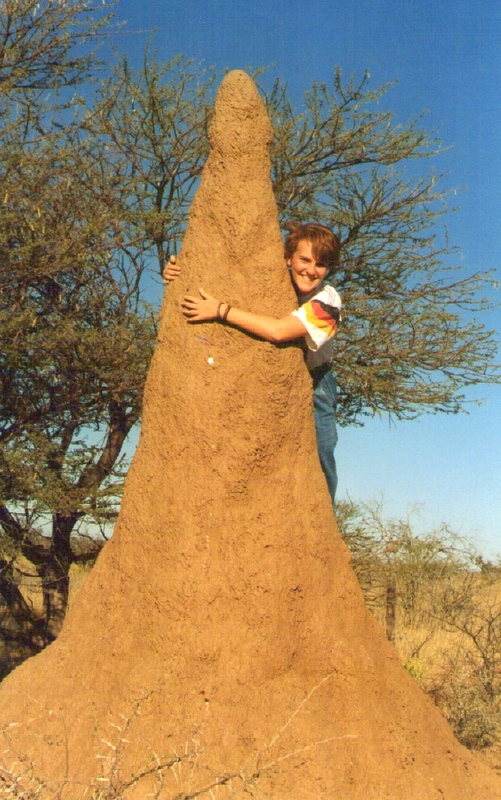 Val had been to Namibia a year before, about a week after it became independent, and spent some time in the archives looking up the history of the Green family, and meeting some relatives and other researchers, like Dag Henrichsen, from Switzerland, who was particularly interested in Fred Green’s eldest daughter, Ada Maria Green, known as Kaera. Val also met a cousin, a descendant of Kaera, Mburumba Kerina, who is credited with the invention of the name Namibia. 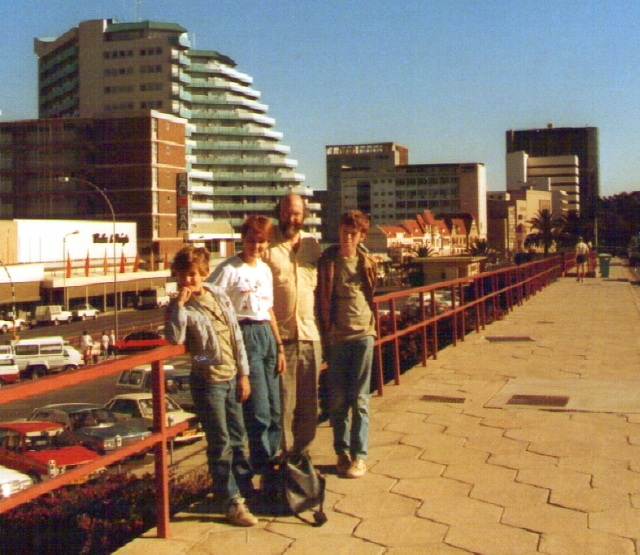 In April 1991, however we all went, driving via Upington and the Augrabies Falls on Bright Monday, spending a night in Karasburg, and reaching Windhoek the next day. It was the first time I had been back to Namibia since being deported nearly twenty years before. It was interesting to see how things had changed in twenty years, and especially since independence. Some friends in Windhoek said that the biggest change had taken place overnight — the moment that the South African army withdrew to south of the border the whole country breathed a sign of relief and peace descended. There were several new buildings in Windhoek, which seemed somehow brighter and more cheerful. We went north to stay ar Gross Barmen, and from there visited Okahandja, Omaruru and Otjimbingwe, places that Fred Green knew well 130 years before. You can read more about Fred Green’s life and times here and here. Left for Namibia at 03:30, and travelled down the freeway to Muldersdrift, then through Tarlton and Ventersdorp. It began to get light then, and between Ventersdorp and Coligny for quite a long way there were road works and deviations. At Biesiesvlei Val took over driving, and we stopped for breakfast in Vryburg at a restaurant that served a “Kalahari breakfast” of eggs, wors, bacon and chips. We reached Kuruman at about 11:00 and had a look at the eye, and the fish in the pool next to it, and filled up with petrol. 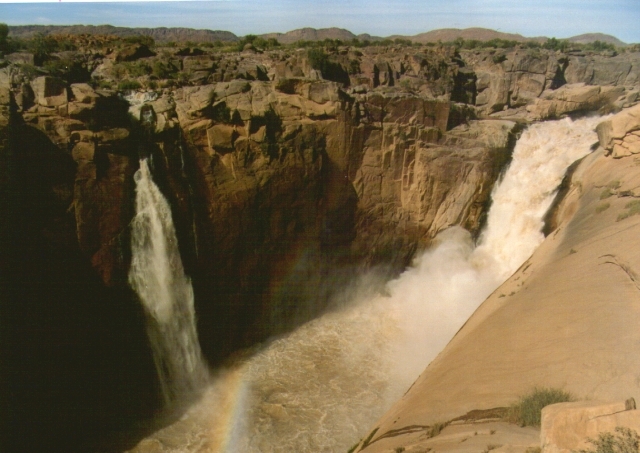 We reached Upington about 14:00, and bought Kentucky fried chicken for lunch, then drove on to Keimoes where we filled up with petrol, and reached the Aughrabies falls at 15:00, and spent about an hour there wandering around and looking at the falls from various viewpoints. Simon found a colony of dassies. We drove west across a flat plain, and contemplated going to Pofadder and possibly sleeping there. 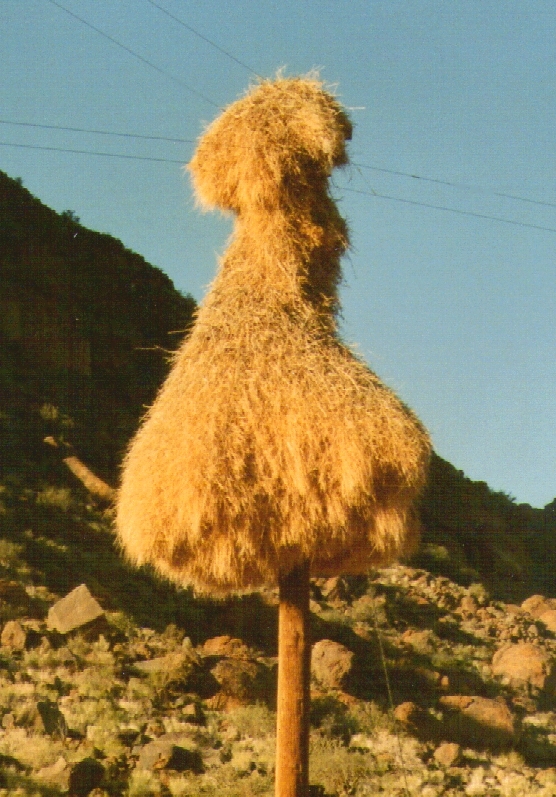 I’d always wanted to see Pofadder, because of the name, and it seemed the most isolated place in South Africa, but the scenery looked boring, and so we decided rather to go to Karasburg via Onseepkans, and it was a scenic drive down to the Orange river with the sun beginning to go down, social weaver nests on the telephone poles, and groves of kokerbome on the hills, and one next to the road that we stopped to photograph. At the border there was a square army tent with a black guy and a white guy in camouflage uniform, looking bored. They stamped our passports, and we crossed the river. It was quite wide there, flowing slowly through pools and reeds – nothing like the roaring rush of water through the gorge upstream at Aughrabies. On the Namibian side there was an identical tent, but the immigration/police officers smartly dressed in navy blue trousers and white shirts. One was reading an English novel with the help of a dictionary – with the official language being English now, a lot of people will have to learn it. We drove into the setting sun towards Karasburg, and arrived there at 19:00. We asked for a room at the Kalkfontein Hotel, and they guy there offered us his “five-star” room, with six beds, and air-conditioner and a bathroom and shower for the all-in price of R175-00 – not bad for these days. We went straight to dinner – mutton stew and vegetables – and then straight to bed. It had been a long day of driving. We woke up about 06:50, and had breakfast at the hotel – similar to what we had had yesterday, wors, eggs, bacon and chips. They had stickers from UNTAG and the Australian Army, relics of the transitional period last year. The atmosphere seemed relaxed and friendly. in marked contrast to what it had been when I left nearly twenty years ago. We left just after 08:00, and drove to Grunau, where we stopped for petrol at the Shell garage just north of the village. There was a shop in the garage with an amazing range of merchandise on sale, and a sign on the door that said “Come in” in English, Afrikaans and Kwanyama – the last seemed rather strange this far south. We bought a map and some postcards, and on the way to Keetmanshoop I wrote postcards to Joy Bidgood, Marios and Kia Prelorenzo. We took photos of the Karasberge – I had been through them many times, mainly at sunrise or sunset, but had never really taken pictures of them, and they were always to me the real sign of entering or leaving Namibia, even though they are about 200 km from the border. At Keetmanshoop we bought a lot of stamps. Some cars had new number plates, with an N, followed by the number, and then a K, instead of the old SK ones. Others had green numberplates with GRN on, which I assumed stood for “Government of the Republic of Namibia” in place of the old A…G numbers. As we went north from there Val and the children stuck stamps on to the “Blue Press” that we were sending out. There was one section where they were working on the road, and we had about 15 km of gravel detour, with great clouds of dust. There were many heavy trucks on the road – far more than I remember from twenty years ago. 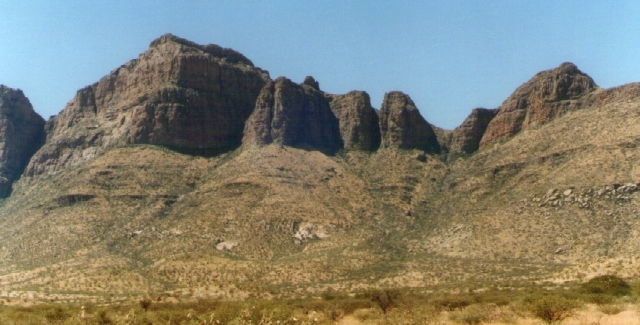 Mukurob, the finger rock, which used to be visible from the road, was also gone – it had fallen down a couple of years ago. We stopped at Mariental for hamburgers – real ones this time. There were many more cafes and shops selling food. Last time I had stopped at a cafe the menu had “Rice – or something else” and a “hamburger” consisted of very greasy mince on toast. Now they had some quite good ones. We posted some of the Blue Presses, and pushed on to Windhoek. Rehoboth, too, seemed much developed. There were street lights on the main road, and many more prosperous-looking houses. We reached the Auas mountains about 15:30, and stopped to look over Windhoek and take some photos, and when we started again the car battery light came on. We called at a garage at the bottom of the hill, and found that it was just that the ignition lock had been in the wrong position. We drove into town, getting lost because of the new bypass roads a couple of times, and went to the post office, and posted the Blue Press for people within Namibia. 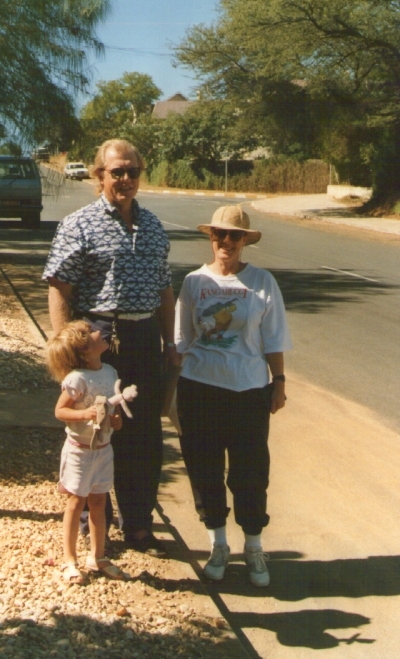 We then went to Klein Windhoek, past 41 Klein Windhoek Road, where I had lived 20 years ago, and called on Val’s cousin Enid Ellis, and stayed for supper with them. Enid’s husband Justin was away at a conference. We saw their son Hugh, now aged 12, for the first time since he was three months old, and their daughter Bronwen, aged 7, for the first time ever. Bronwen was embarrassed because she had been to the beach at Swakopmund, and had been bitten by sandfleas, and was all over itchy bites. would be good to meet again on Namibian soil. Enid said that locally people spoke of the GRN number plate vehicles as standing for “Go Round Namibia”.After supper we drove to the Daan Viljoen Park on the Khomas Hochland road, and slept in a couple of huts there. We went in to Windhoek in the morning, and parked in a parking ground opposite the Zoo Gardens, and went in to Wecke and Voigts, where I had bought a hat once. I looked for another hat like the one I had lost in Swaziland, but they only had JB Stetson Texan-style hats that would have been OK if it hadn’t been for the TV character J.R. Ewing. But in a shop next door they had some nice hats. A little further down the road there was a new pedestrian mall that went over Stuebelstrasse, and was very pleasant. We stopped at a kiosk there for some ham and salami brotchens for breakfast, and a guy came up and said he was hungry, and we gave him some money and he promptly bought chips and all the most bulky things he could get. We left the children looking at shops for stickers and T shirts and things, and went to the archives, where we saw Brigitte Lau, and told her about our project for transcribing Ada Leinhos’s case against the South West Africa Company. She said we had given so much stuff to the archives that she would give us a free copy of the German war map, which showed Frederick Vincent Green’s birthplace of Ehangero, on the Omuramba Wamatako, about 20km west of the present Okahandja-Otjiwarongo road. We looked up a few other things, and photocopied some missing pages from the court case. Then we went to the Safari Motel to wait for Dave de Beer, whose conference was finishing. We had lunch at the Safari Motel with Dave, who told us something of what he had been doing. He had visited Gobabis with his parliamentarians, and they had stayed at the hotel there, and seen the jail. They had also visited Epukiro, where chief Munyuku was cooperating with the establishment of community farms. Dave said they were particularly concerned about health services, and that the nurses said that there was a lot of high blood pressure among Hereros, presumably because of all the milk and meat they eat. He said that in Ovamboland the traditional healers were cooperating with the health services, but when he asked about it in Hereroland, people were very cagey, though he had no idea why that should be so. 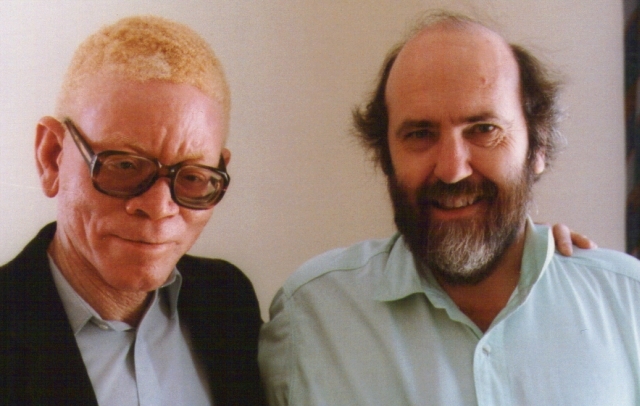 He also said that Mburumba Kerina had been kicked out of parliament – I hadn’t known that he was in, but apparently he had represented a small coalition of his own group and the Rehoboth Basters, and Sam Nujoma had taken him and some of the other original petitioners to the United Nations along with him when he went there to apply for membership of the UN, even though they were now political rivals. This had led to Mburumba Kerina and Sam Nujoma being reconciled, and Mburumba joined SWAPO, so his original group obviously no longer wanted him as their representative. He said Assaria Kamburona was very active politically in the DTA, and that political differences had split the Oruuano Church, though he didn’t seem to have much evidence for that. Hiskia Uanivi is still, apparently, active in his Communist Party. While we were talking, Zephania Kameeta walked by, and said we could see him tomorrow at the Lutheran Church offices, where he is staying in a guest room. We took Dave to the Anglican cathedral, and looked for Roger Key in the deanery, but he was out, so Val took some pictures of us together up by the bell, and we took some photos of the whole family there. We went down to the diocesan office, now in Fr Willie van der Sijde’s old house, and spoke to the diocesan secretary, who said that the diocese was chronically short of money and didn’t have enough to pay clergy stipends – though it was in the pockets of the people. It reminded me of the day I arrived [in 1969], when Dave himself was diocesan secretary, and he had R95.00 in the account and had to pay stipends the following week. We gave a calendar to Dinah Handura’s daughter, who worked in the office. Dinah had cleaned our house in Klein Windhoek. Then we took Dave to the centre of town, and went to the OK Bazaars (another innovation since I was last here) and bought some ingredients for a braai tonight, and went back to the Daan Viljoen Park to prepare it. Enid, Hugh and Bronwen joined us about 16:30, and after walking around the dam we had a braai – except for Bronwen, who is vegetarian, and we chatted about old times, and caught up on the news of what we had been doing since we had last met 12 years ago, when we were in Melmoth and Enid was about to leave for England. The children all played soccer, and seemed to get on well together. We drove around the Daan Viljoen Park before leaving, and saw several animals – jackals, tsessebe, kudus and wildebeest. We again went to town and had brotchens for breakfast, then went to see Zephania Kameeta. He said he and his wife had bought a house in Mariental, as she originally came from there, and houses were much cheaper. Their white neighbours were very right-wing, and it was a new experience for them to have blacks living next door. Zephania said that cabinet ministers were civil servants, and so got housing allowances, but on an MP’s salary he could not afford a house in Windhoek. We remarked on the relaxed and peaceful atmosphere in the place, and he said that it had originally seemed strange to think that they could cooperate with some of the right-wing political groups like ACN, but that when they did so, things seemed to work well. Zephania said he had done research into his own family history from the church registers in Otjimbingwe, where he himself had been born, and said we should go there and ask the Pastor, Pastor Mujoro, if we could look at the early registers, which should still be there. We left Windhoek then, and drove around Katutura for a while, and stopped to take photos of the graffiti on the Ovambo compound, which were colourful, and wondered what the compound was used for now. There was a new four-lane highway as far as Brakwater. At Okahandja we drove around for a while looking for Maharero’s grave – it was far more hidden away than I remembered it, and then went on to the resort at Gross Barmen, where we stayed in a marvellous flat, complete with air conditioning, chairs and tables, and we relaxed for the rest of the afternoon and in the evening went swimming before having dinner at the restaurant, and we chatted to the waiter who was Kwanyama, and knew Nehemiah Hamupembe and some of the Anglican clergy at Odibo. We were up early, and drove along the back road to Wilhelmstal, where I had gone when I worked for the department of water affairs. We saw lots of game – jackals, kudu and gemsbok – all along the road. We then went to Omaruru, which was much more green and pleasant than I remembered it. We stopped at a small cafe for breakfast – again our ham and salami brotchens – and handed out St Nicholas Calendars to everyone we met. We went to the municipal offices where there was a sign advertising tourist information, and spoke to a Mr Bester, a former policeman who had come here from South Africa in 1964, and stayed on when he left the police force. He told us about some of the tourist attractions in the area, and we bought a couple of booklets as well. He showed us some maps, and some reports of a geological survey done by people from Rhodes University a few years ago – they said that the nearby Erongo mountains were the largest volcanic formation in the Southern hemisphere. We drove through the Erongo mountains, wishing we had more time to spend here and explore. I remembered one, in particular, that looked like an enormous lizard, and when I passed in when working at the Department of Water Affairs it had seemed as though this was the end of the world. Knowing the country beyond it, it now seemed much more tame. We drove south past the western edge of the mountains, stopping to take photos of the Erongo and Spitsberg. I had once travelled along this road when the sun was setting over the Spitsberg and the moon rising over the Erongo, and it had been spectacularly beautiful. But even in the middle of the day there was a grandeur to it. We stopped for cold drinks at Usakos, but most of the shops were shut for the afternoon siesta. 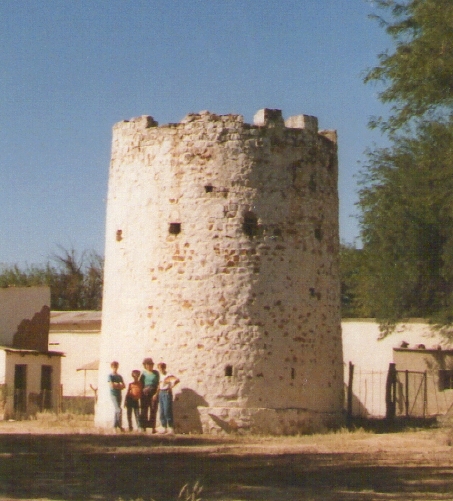 We went on to Karibib, where I wanted to take pictures of the old hotel, but it had vanished, and someone said it had been demolished 16 years ago, which was sad, because it had been the most interesting building in the town. We went down to Otjimbingue, and looked for pastor Mujoro, and found there were two pastors – a husband and wife, but the wife was out at the church council, and the husband was asleep and apparently not to be disturbed, so we did not get to see the church registers, but took photos of the powder tower, allegedly built by Fred Green in the 1870s. As we were leaving Otjimbingue, the exhaust pipe fell off, but we were able to tie it up with a bit of wire, and got back to Gross Barmen roaring like a ferry. My 50th birthday. We packed up at Gross Barmen, and drove in to Windhoek, went straight to a garage called Auto-Fit, where they repaired the exhaust pipe, and then once again parked at the Zoo Gardens parking ground, and got brotchens from Wecke and Voigts for breakfast, and then went round to Kerina’s office in Kenya House in Leutweinstrasse (he’d said the street name had been changed to Mugabe Avenue, but all the old signs were still up) – it took us some time to find it. He had said it was the former Grand Hotel, but only when we got there did my memory of it come back – I’d met some journalists there from the Argus Africa News Service once. But Kerina was not in. A guy at the reception counter was rather cynical – Kerina had said he would meet us at 09:30, and the guy said that meant he wouldn’t be in before 10:00. We went to see Roger and Shaunie Key at the Anglican Deanery, and chatted to them for a while, and Roger got me to sign the Cathedral visitor’s books. He said he’d been very surprised to receive the Blue Press we had sent him [it was Roger who told us how peace descended on the country when the South African army left]. We made another attempt to see Kerina, but he was still not there, so we left Windhoek, driving south to Ai Ais. We turned off the main road at Kalkrand, and went towards Maltahohe, reaching it at about 14:00, and filled up with petrol there. The town seemed absolutely dead. We drove on to Helmeringhausen across the flat and dusty plain, with the iron-red plateau range on the left. Helmeringhausen too was dead on a Saturday afternoon, a little hamlet with stone houses that looked as if it hadn’t changed for 80 years. We drove on to Bethanien, and took some photos on the way, and stopped at Bethanien for petrol, and then drove on to Ai Ais as the sun was setting, seeing the Karasberge from the west this time, looking very different. It was dark by the time we got to Ai Ais, and we only just made it to the restaurant before they closed. After breakfast we walked around for a while, looking at the Fish River canyon, and bought a few things at the shop, and then drove back north along the road we had come down in the dark last night, and went to the view point on the Fish River Canyon and took photos from there. We then drove to Grunau, and bought hamburgers and wors rolls for lunch. We debated going south via Vioolsdrift, Springbok and Pofadder, but decided that it was too late for that, and took the direct route through Karasburg and Ariamsvlei. We passed the Namibian border control post just past Ariamsvlei, quite a way before the actual border. Though it was a prefab building it looked quite smart, with the flag flying, and immigration officers who were polite and efficient. About twenty km on we came to the South African “monitoring post” – a khaki tent, no flag, and an enormous Casspir armoured car parked outside. There were three scruffy looking characters in camouflage uniform sitting at a folding table covered with cold drink cans – one to write down the information in the passports, the second to stamp the passports, and the third to read the picture story book. It could hardly have been a greater contrast. I’d bought a copy of the Sunday newspaper “Rapport” in Grunau, and we were back to the reports of violence. Virtually nothing was said about any news in Namibia at all. We filled up with petrol in Upington, and set off for Kuruman as quickly as possible, as the car lights weren’t working properly, but by sunset we had only reached Olifantshoek, so we booked in at the hotel there. It was very pleasant. We had a good supper, and it was cheaper than Karasburg. We celebrated with a bottle of 5th Avenue Cold Duck, and when we popped the cork it hit the ceiling and squashed a mosquito there. 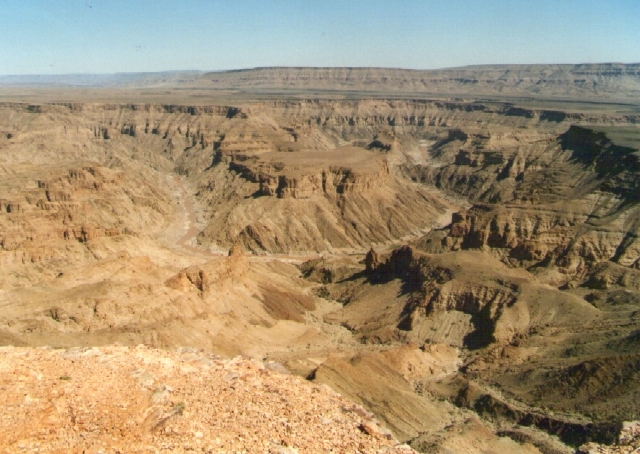 Biesiesvlei and Ventersdorp. We got home about 16:30, and there was a policeman there guarding the house. someone had broken in sometime, and broken seven window panes, but they appeared to have been disturbed, as apparently everything they had taken was at the police station. Marios came round, and said he thought the break-in was last night, as he had come to check the place and found all the lights on. 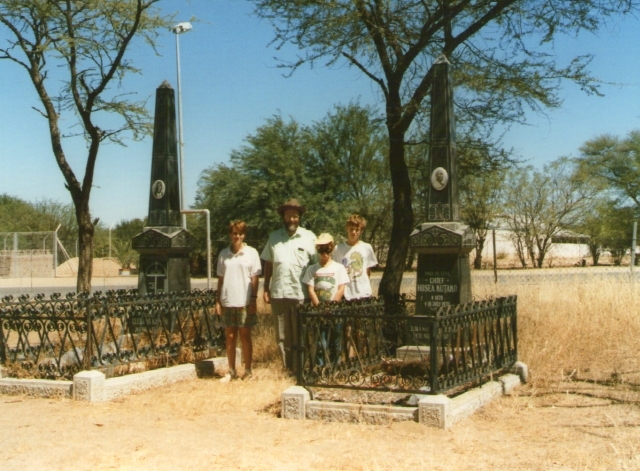 Much of the country we passed through on this trip would have been familiar to Fred Green, his wife Catherine Stewardson (who was born at Rooibank, near Walvis Bay) and their older children — Mary, who was born in Ovamboland, and Fred junior (Val’s great grandfather) who was born somewhere east of Omaruru.The graves of the Herero heroes took on a new significance when we discovered that Fred Green and Samuel Maharero had been firends (though they had also fought), and Samuel Maharero made a grant of land to Fred Green’s daughter Ada when the Germans were beginning to colonise the country. The Germans tried to give her land to a commercial company, but she took them on in court, and won. When the South Africans invaded in 1915, she had to fight the battle all over again, and won a second time, and she then lost it all when she stood surety for her no-good son-in-law. 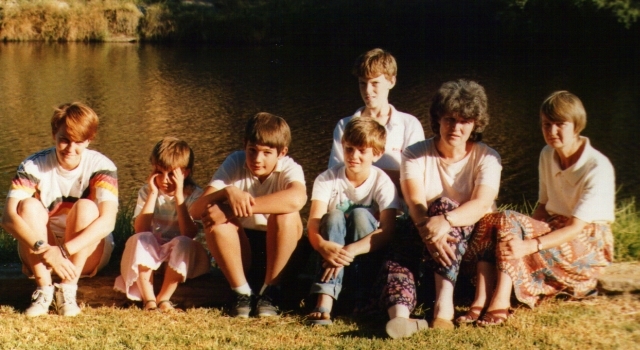 When we started our family history research in 1974 we didn’t have a clue about the Namibian (or Canadian) connections of the Green family, and we only learnt them when we made contact with Val’s great aunt Gladys Clark, so this trip enabled us to look at things with new eyes. We’ve been planning to go on holiday to the Western Cape after Easter, and visit fri9ends and family, but it seems that several of the cousins we were hoping to see will be away at the very time we are there.